When it comes to remodeling older homes (those older the 75 years), there's often more to the process than simple swapping out old for new. Since our home construction methods have changed, both for safety reasons and because we've generally improved materials and techniques, starting a renovation on an older home has the potential of opening a can of worms. 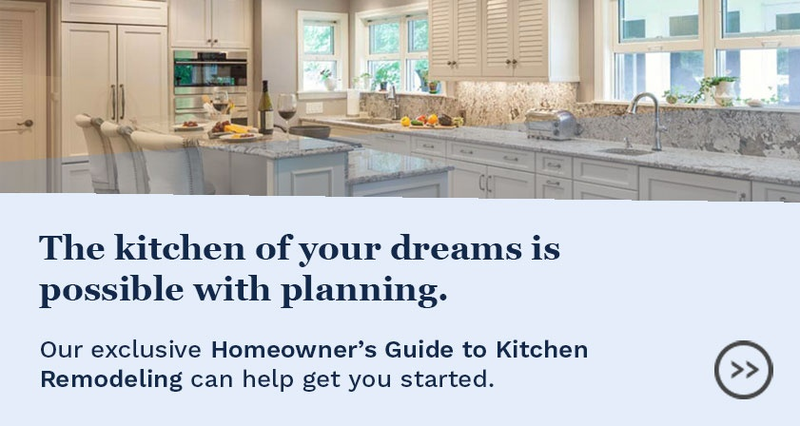 Even if everyone is prepared for the chance that the remodel will reveal major issues, the challenges of remodeling an older home continue in the design phase. 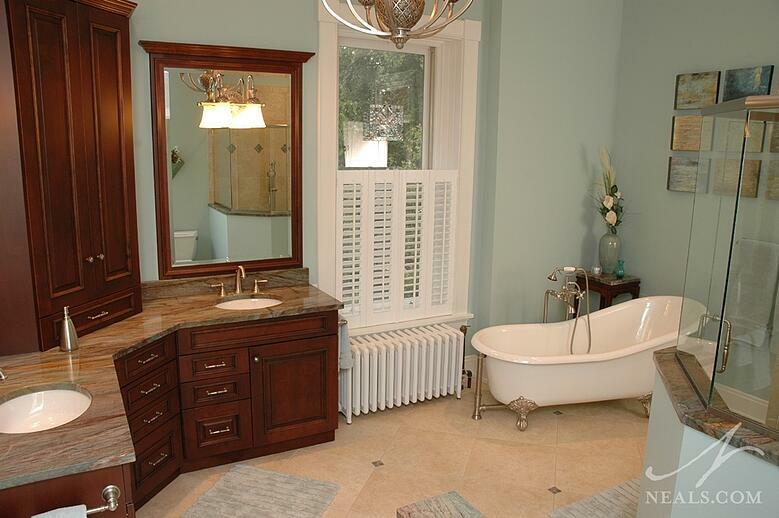 A traditional bathroom remodel stays true to this Hyde Park home's age. When updating the design of spaces in older or historic homes, it's good to start with one basic question. Do we stay true to the style of the home or do we update to our tastes, which may be different? The reality is that either answer is correct, but it's important to weigh the impact of each. In general, when a home is updated to styles that feel current, regardless of the home's age and style, it's a fairly safe bet. The key is to limit trends or quirky choices, so that the design feels as timeless as the house. This can work with a variety of styles. 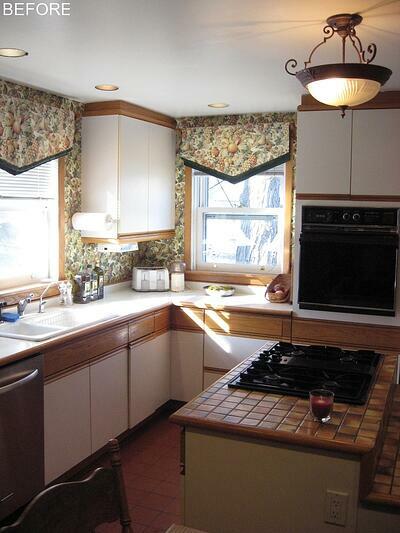 This contemporary kitchen and bath can be found in an Oakley home built in the late 1800's. The contemporary kitchen above is a Neal's remodel completed in a home built in 1881. It works because the modern kitchen is a sedate and streamlined design that creates a contrast to the home's age. 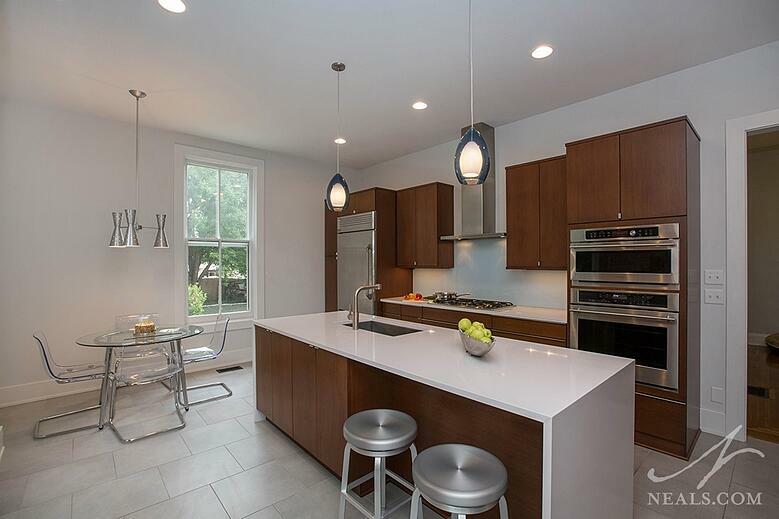 The walls, windows, and lighting where all updated, so the contemporary cabinetry and island don't stand in stark contrast to the older environment. This choice isn't for everyone, but if your tastes are more modern than traditional, it's worth considering the impact of marrying the two design styles. A kitchen remodel in Glendale brings a cottage feel back to the turn-of-the-century home. Choosing to remodel your older home in a style consistent with the home can bring its own set of rewards. In many cases, older homes have already endured a renovation, particularly in the kitchen or bathroom. It was quite common in the 70's and 80's to replace original rooms with the latest trendy looks, which 30 years down the road are dated and make the remodeled space feel disjointed from the rest of the home. The kitchen above (see the before below) is an example of how remodeling in keeping with the home's architectural style, in this case a cottage look, can improve the home and restore its character. Updating in this manner doesn't mean skipping out on modern conveniences. Instead, the new is blended with the old in a more classic manner that should serve this home longer than the previous remodel did. Before of Glendale kitchen above showing a previous remodel. 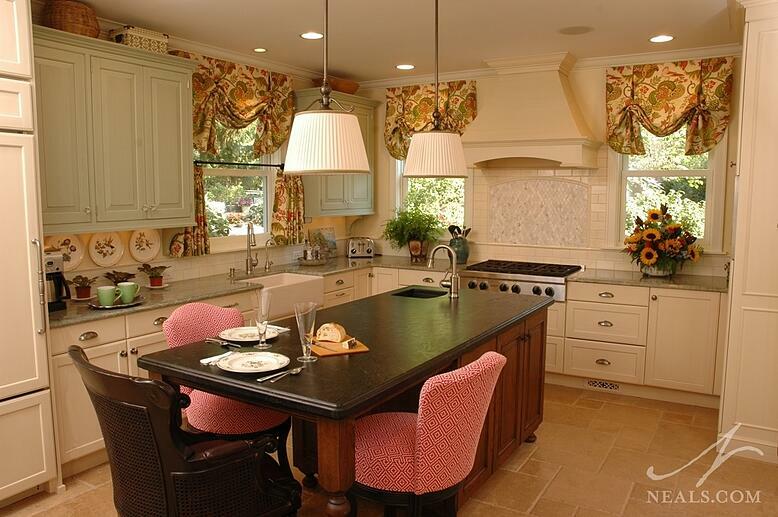 It may also happen that your older home still retains the original kitchen or bathroom. When the house is 75 years or older, this can be an obstacle for the modern family. In the past, these spaces where not meant to be lingered in by the family and their guests, so they often feel crowded, awkward, or just too plain. In this Hyde Park kitchen below, the kitchen was divided into four separate rooms, a butler's pantry, a traditional pantry, a back entry, and the kitchen proper. By opening these rooms onto each other, a new kitchen would be formed that provided the type of space the family required. 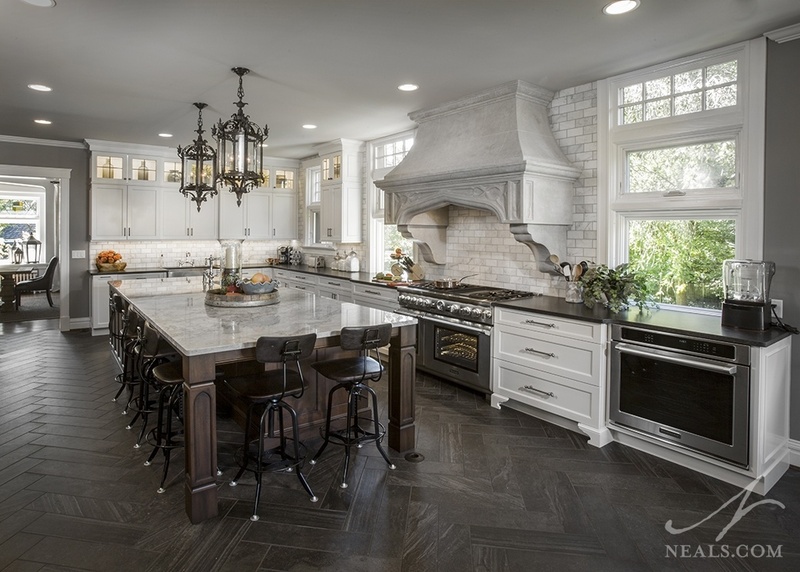 The design of the new kitchen, however, pays homage to the home in the details of the island and the style of the hood, making it feel more appropriate to the home's pedigree than the original spaces did. This Hyde Park kitchen remodel combined four rooms to form a new space that better suits the home's American Gothic look. When remodeling an older home, it's important to not only keep the home's structural needs in mind, but to also keep an eye out for details to be revealed that may prove to be an asset to the remodel. For example, in the kitchen remodel below, it was discovered that a brick chimney and support column had been concealed behind the drywall. This feature, original to the home, offered the opportunity to bring a unique detail to the remodeled kitchen. Though it did require a rework of the design, and some creative cabinet fitting, the inclusion of that re-discovered brick makes for a more interesting design. 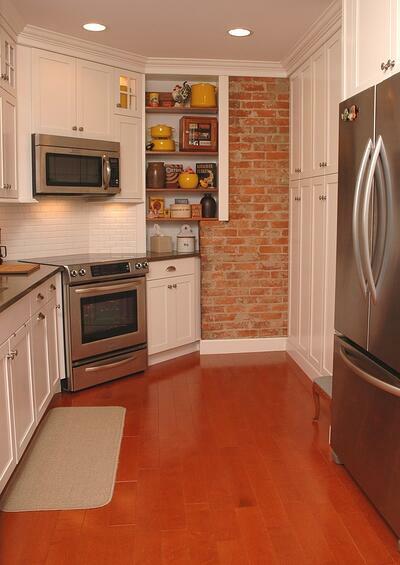 The brick in this Hyde Park kitchen was revealed and restored during the remodel.